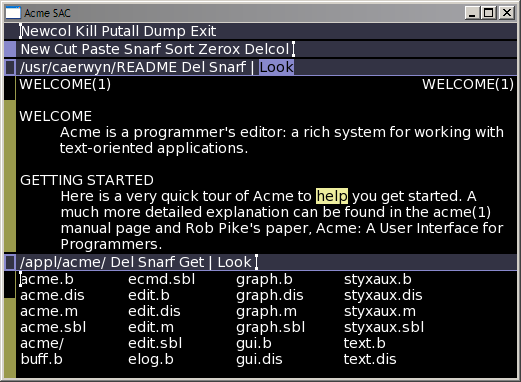 The inferno version of acme always contained some code to configure the acme color scheme, but I'm not sure if it always, if ever worked. I modified the code a little in acme-sac to make the color configuration work. And I came up with a few new schemes. Running the "evening" scheme will make acme look like this. This sets the foreground text color in the body text to black. It's possible to mix two colors, as for the standard acme background. Another simple scheme is "bw" for black and white. 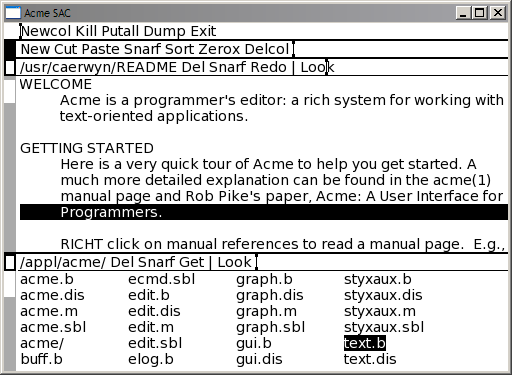 There is also a file /acme/color/standard for the default acme color scheme which can be copied tweaked. Thank you Caerwyn, this modification has been VERY helpful. I even created my own custom scheme, based on Ethan Schooner's Solarized Light. Is there a way to have the tag that changes to Dark Medium Blue whenever the file content is modified (modbutcol), also become a part of the /acme/color/ layout?